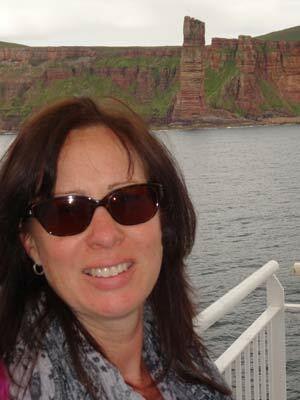 In late July 2013, Kelly and I travelled to the UK from our home in Sydney, Australia, for a holiday. The primary aim of the trip was to dive the German World War I warships at Scapa Flow in Scotland and the rest of the holiday was tacked onto this. Scapa Flow is a waterway located in the Orkney Islands which are off the top of the mainland part of Scotland. The Orkneys are a series of islands, with only one with any degree of inhabitation and visitor facilities. This is Mainland. Generally the islands are all low rolling hills, devoid of trees and windswept. It is very green, amazingly so for us travelling from Australia. On the southern side of Mainland is a large bay called Scapa Flow. This is about 15 kilometres east-west and 10 kilometres north-south. It is formed by a series of islands on the south, west and south-east. These include Hoy to the west and South Ronaldsay to the south-east and some smaller islands to the south. All this makes Scapa Flow a very protective waterway which was used in World Wars I and II by the Royal Navy as its main base. The main town of the Orkney Islands is called Kirkwall which is at the north-eastern corner of Scapa. The other main town is Stromness which is located just outside Scapa on the north-western corner. 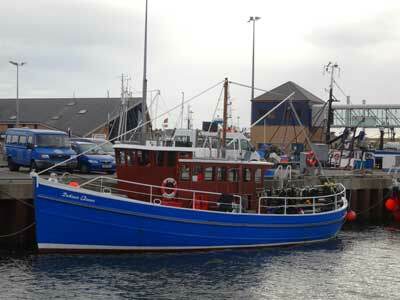 For diving purposes, Stromness is the location used by most (if not all) of the dive operators. Of course, being so far north, the Orkney Islands never gets too hot and even in summer, temperatures generally only get to about 16°C maximum. When we visited in early August the temperature ranged from 13° to 15°, even with the sun out all day. Nights were not too cold, perhaps 10° to 11°. The dive operators only operate in a limited season, which is basically mid-spring to mid-autumn (say mid-April to mid-October). The water temperature early can be as low as 6° getting to as high as 13° in late August. We had 11° to 12°. Another advantage of visiting in summer is that the days are so long. We had daylight starting about 4 am and ending about 10:30 pm when we were there. Therefore, for most people visiting from warmer climates, the best time would be mid-July to late August to get the best of air and water temperatures. Water visibility is said to be best in the colder months. From Australia, it is a long trip that is for sure. We travelled by Emirates from Sydney to Dubai and then Dubai to Glasgow. We used Emirates as they have a 30 kg baggage allowance which we needed to carry all our dive gear (including drysuits and undergarments). Emirates is also the only airline that has a one stop way to get to places like Glasgow, Manchester etc from virtually anywhere in the world (excluding North America). This avoids the need to go through Heathrow at London and also fly on airlines with nil or low weight limits for baggage. 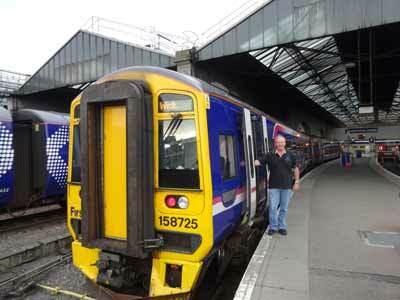 The flight into Glasgow arrives at 12:30 pm, meaning you have half a day to travel before you need accommodation. From Glasgow we hired a car and spent two and a half days sightseeing through Scotland before heading up to Scapa. You could catch a train from Glasgow as well. We ended up at Inverness on the Friday (all dive trips start on Saturday afternoon). This was the northern-most place we could leave a rental car. We could have taken it over to the Orkneys, but it would have been a waste of money (rental and ferry) as we had little time to use it. We stayed the night in Inverness and then early on Saturday morning we caught the train (7:06 am) to Thurso (make sure you stay near the train station so you can walk there). Thurso is at the top of Scotland. The train takes just under four hours and is a very comfortable way to travel, with excellent views out of the train (sit on the right side going up) as the line follows the coast for a lot of the way and also goes up a couple of very scenic river valleys. The trains have lots of space for bags and also a coffee/tea service. From Thurso we caught a cab to Scrabster, only a few kilometres away. This is where the ferry to Stromness leaves from. The ferry is very large, capable of carrying lots of semi-trailers and cars. The ferry trip takes about 90 minutes. It has full food and bar services. 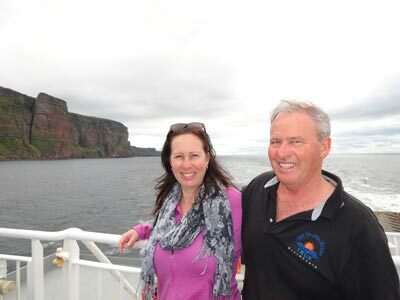 The trip goes past the western side of Hoy Island where you can see the Old Man of Hoy, a very spectacular rock that sticks up out of the sea. The sheer cliffs of Hoy near the entrance to Scapa are also amazing. 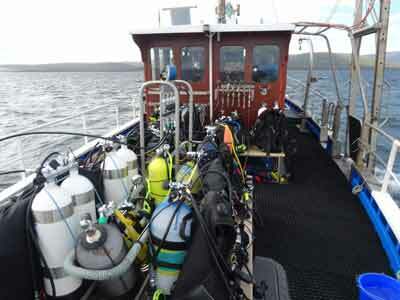 At Scrabster you put your dive gear in special dive lockers (wheeled trolleys) that are towed onto the ferry. At Stromness the lockers are moved out onto the wharf area outside the secured area. You can either push the lockers over to the wharf where the dive boats go from (about 30 metres or so) or take your bags out and take them over. 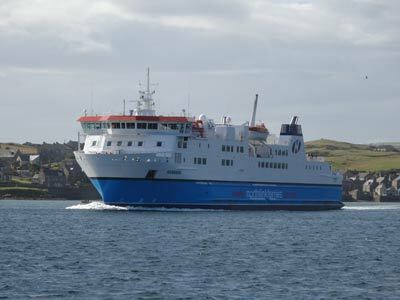 You can also catch a ferry from Inverness to Kirkwall or from Gills Bay to South Ronaldsay Island. As mentioned, Scapa Flow was the main Royal Navy base during World War I. The Grand Fleet was based there. After a cease fire was declared on 11 November 1918, the war officially still existed, but there was an armistice. As part of this agreement, Germany had to surrender into Britain's hands 75 of its warships. The ships steamed out of Germany on 21 November 1918 in single file, commanded by Rear Admiral Ludwig von Reuter. They were met at sea by a combined fleet of 370 British, American and French warships. The fleet arrived in the Firth of Forth (Edinburgh) later that day. Then, between 25 and 27 November 1918 they were escorted to Scapa Flow in the Orkney Islands, Scotland. Upon arrival, all wireless equipment was removed from the ships and the breech blocks of their heavy guns were removed to prevent their use. Crews were reduced to minimum levels. The fleet remained in captivity during the negotiations that ultimately produced the Treaty of Versailles. Reuter believed that the British intended to seize the German ships on 21 June 1919 which was the deadline for Germany to have signed the peace treaty. Unaware that the deadline had been extended to 23 June 1919, Reuter ordered the ships to be sunk at the next opportunity. On the morning of 21 June 1919 the British fleet left Scapa Flow to conduct training manoeuvres, and at 11:20 am Reuter transmitted the order to his ships and they were all scuttled. Most sank totally but a few were saved by being towed into shallow water before they could completely sink. In the 1920s and 30s most of the ships were salvaged and today only seven of the original ships remain on the bottom. These comprise three battleships and four cruisers. There are also other wrecks and wreckage to dive as well as two British warships that cannot be dived. 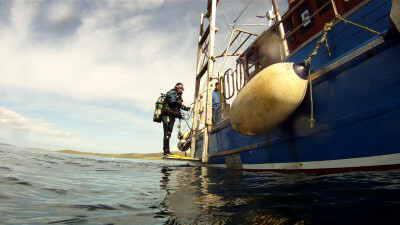 There are a number of dive operators, perhaps about 10, who run trips to the wrecks in Scapa Flow. When we visited there were only about four others that we saw regularly. 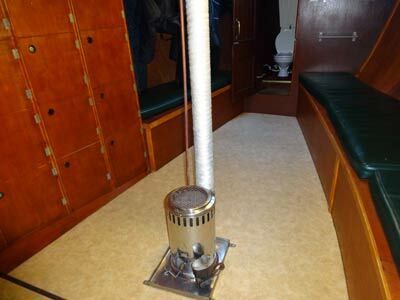 All use old converted timber trawlers and look to be in various states of repair. Most of the boats moor their boats in the small harbour next to the ferry terminal. We used Radiant Queen which had been recommended to us by a number of people. When we went to book over 18 months before the trip, all the dates in late July to end of August were already booked out! Luckily, we ended up on a trip organised by the Aberdeen University Sub Aqua Club which had booked out the boat for the first full week of August and who had a few vacancies. The Radiant Queen is a great boat, immaculately kept (freshly painted, clean) and owned and run by Emily Turton. She is a rebreather diver who loves wrecks and has become an expert on the German fleet. She also draws brilliant diagrams of the wrecks for her dive briefings. These are the best I have ever been given about any wreck I have dived (and I have done more than a hundred individual wrecks). The boat carries 12 divers and one deckhand. The boat has a rear deck where all the setup tanks are kept. In front of this is a smallish cabin where all the divers can fit. 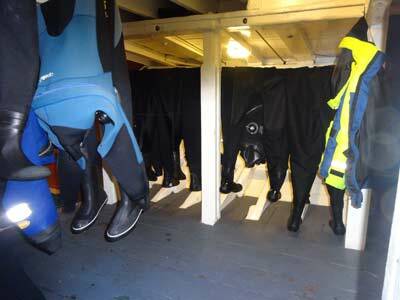 Below the cabin is a dry area for undergarments and behind this a wet area for drysuits/wetsuits. You exit up a ladder to the front of the dive deck. 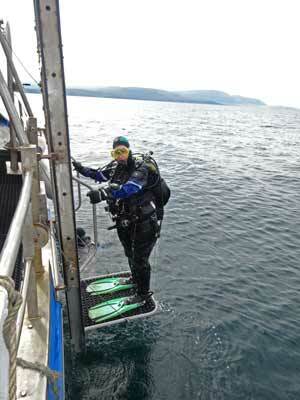 There is also a diver lift that is used to get you from the water back to the deck. On arriving on the ferry, you take your gear to the boat and set up your BCD and regs on a tank and put your drysuit and undergarments in the lower compartments. All is now ready for departure the next morning. It also has a full size toilet. Yes, a flushing one, just like your house. It has heaps of room, unlike most boats. Easy, even with lots of gear on. Huge mugs of tea/coffee/hot chocolate are served (with biscuits) after each dive (with refills). You can also pay extra for lunches (or bring your own). We opted for the small size and this was more than enough. Lunch consisted of hot meals such as curry, sausages, stews with cordial and cake or dessert afterwards. Emily makes all this herself and it is excellent. This cost about �6.50 (say AUS$11). You can bring your own lunch, but to be honest it would be a bit of a pain. Take a bottle of water out with you. Radiant Queen departs about 8:30 am and returns about 4 pm or so. It is one hour to the wrecks (all the boats only do about 8 knots). 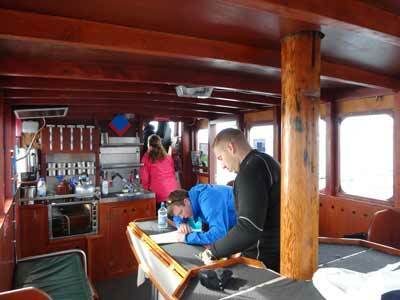 In between dives you get about 2.5 to 3 hours surface interval. You can use 12 or 15 litre tanks (with good fills to about 220 to 230 bar). Nitrox is also available. We also hired a largish pony bottle from the local dive shop (owned by Emily's partner) and filled with 50% Nitrox. For the shallower wrecks we used 30 to 32%. For the deeper wrecks, we generally just topped up with air and this gave us about 25 to 26%. Nitrox fills cost �7.50 for up to 32% (air free). 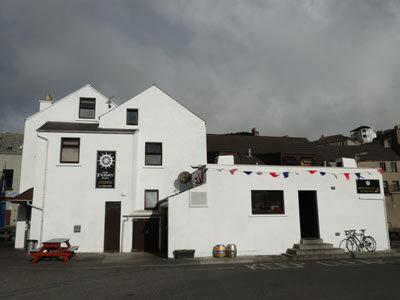 Accommodation for Radiant Queen is in a dive lodge located about 50 metres from the wharf behind the Ferry Inn. It has room for 12 people (a few more in fact depending on numbers of males/females etc) in five rooms over three levels. There are two double rooms as well. There is a nice lounge area with a good kitchen. There are at four bathrooms. The top level has a large bench where you can set up all your recharging gear and leave it all week. There were plenty of powerpoints (we of course needed to bring an adaptor and a double adapter so we could charge all our things). Cost of a week's diving (12 dives), tanks, weights, seven nights accommodation with Radiant Queen worked out at �440 (say AUS$725) each when booked as part of the larger group. This represents excellent value, at $122 a day for diving and accommodation or $61 a dive. Kelly and I ended up spending another $250 betwen us on Nitrox. There are also two dive shops, both of which are connected in one way or another to one or more charter boats. You can get anything you need from them, especially Scapa Scuba. As far as I could see, all the diving in Scapa Flow is done in a similar manner. This is quite different to how we dive in Sydney, but is similar to how people dive in Melbourne and most of England. All the wrecks have at least one bouy on them, but this is only a light line and is not suitable for mooring a boat to, even a small one. The shotlines are used solely for descending onto the wreck and most people do not use for ascents. Once a wreck is being approached, divers gear up and move to the appropriate spot on the boat to jump in the water. The boat goes up current/wind and then two or three divers enter the water in close proximity to the shotline. The currents when we were there were very minor and of no concern. This was also at full moon when the currents should be at their strongest. Once in the water, you descend down the shotline. It is important to keep contact with the line as it would easily be possible to miss a wreck totally due to the limited visibility. Once your bottom time is up, most divers shoot an SMB (surface marker bouy) and ascend up that. Kelly and I mostly decided to ascend back up the shotline, although for some wrecks we did shoot an SMB. The problem with the shotlines is that the bouy on them is very small and on at least one wreck which had a slight current, we pulled it underwater and when additional divers came up the line, we had to let go as it was now deeper than our deco stop. The seas are so flat it is very easy to keep track of the various SMBs. Once you surface, you indicate to your boat (there can be up to three or four on one wreck, although this was very unusual while we were there) and they will come and pick you up. This may take a while as other divers may have surfaced before you. The diving was a lot easier than I thought it would be. Due to the cold and dark water, as well as the prospect of current, I had thought it may be very demanding. It was not. However, I would not recommend diving here to inexperienced divers, epecially ones who are not experienced in using drysuits and cold water diving. For breakfast we purchased things from one of the two local shops. There is a Co-operative about 500 metres to the north of the accommodation and a smaller shop about 200 metres south in the centre of town. The best one is the larger Co-operative. Both also sell wine and beer. We also ate in three nights, getting ingredients from the shop. There are a few places to eat out. The Ferry Inn has nice food, but like most pubs in Scotland, there is only a very limited range of things to choose from. We ate there three times. 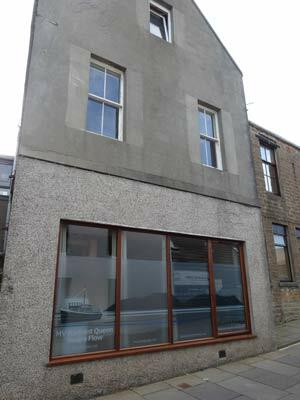 The Stromness Hotel was a bit more up class with a better range but at a higher cost. It was good. There is also a fish and chip shop, but it was closed on the night we wanted to have it (it was show day at a nearby town and most shops were closed that day). There is also another pub, the Royal Hotel, but it did not look all that inviting so we never went inside. There is also a restaurant but we never saw it open so we could book. If you have access to a car (we did as the dive club brought over the mini-bus they travelled up from Aberdeen in), you can go to Skara Brae, a 5000 year old underground village. This amazing place was only found in the late 1800s. You can also go to the Standing Stones of Stenness, a sort of Stonehenge like arrangement of huge stones. 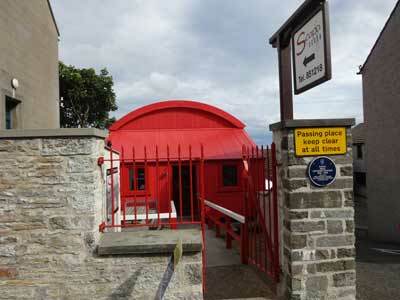 These are only a short drive from Stromness and you can easily do them after returning from diving and before dinner. On one day, your dive operator will likely take you to Hoy Island where you can visited the war museum and also the war cemetary. 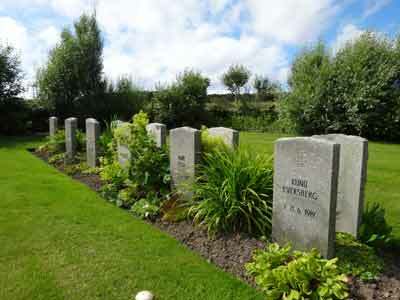 This is where the German sailors who were murdered (yes, it was murder) by British sailors/soldiers are buried. The museum is very good, with many artefacts from the ships. You can also go for morning or evening walks. As the sun was up so early and we did not leave till 8:30 am, I used to go for an hour's walk each morning to a different part of the town. There is also a golf club but I am not sure how you would go about hiring clubs. This was a brilliant start to our UK trip, with the diving fantastic and the dive operator one of the best I have used anywhere in the world. 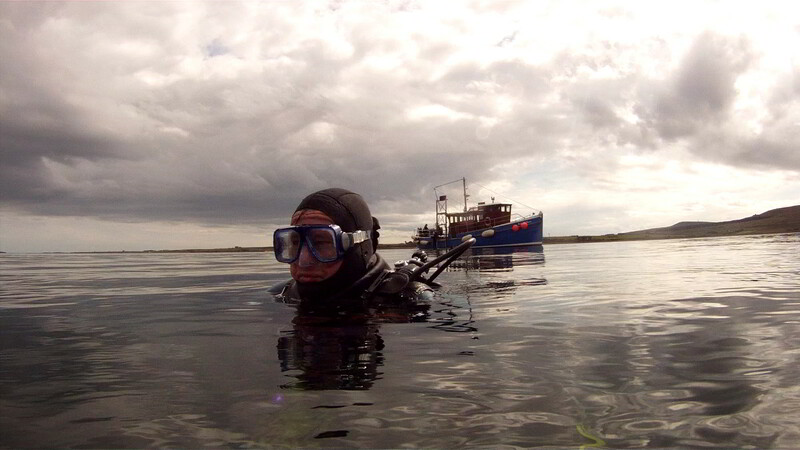 Even if you are not a diver, the Orkney Islands is worth visiting as it is a very historic and beautiful place.